I installed HAXM 1.0.4 and I cannot run Android emulator with option 'use host gpu' checked, it shows cyclic GL_* errors. I am using Mac OS X (mbp with NVIDIA GeForce 320M). Without gpu emulation everything works fine (well if word fine can describe that slow piece of software). I have 8GB RAM, HAXM set up to use 1024MB. My virtual devices set up to use 512 MB (I have tried different values, but less then 1024Mb, according to HAXM doc). Also I tried to set LD_LIBRARY_PATH to <sdk install location>/tools/lib and that doesn't help me either. They say "Make sure that your environment variables for the GL libraries are set correctly". How can I check this? Other programs are working well. Without HAXM GPU acceleration is working well. I should also add that errors occur only with Intel 2.3 x86 system image. With the newest 4.1 everything works fine. Additionally, in your last line of the question you mention that in the 4.1 image everything works fine, whereas in the intel 2.3 x86 image it does not. According to the documentation, graphics acceleration is supported in SDK Platform API 15 revision 3 (4.0.3) and higher. Assuming that your remark about intel 2.3 x86 and 4.1 refer to Android version 2.3 and 4.1, respectively, this would be in line with the android documentation. Furthermore, take a look at the Android Project Issue Tracker for similar bugs and updates. There's also a pertinent question on StackOverflow with some useful suggestions and user activity. Not the answer you're looking for? 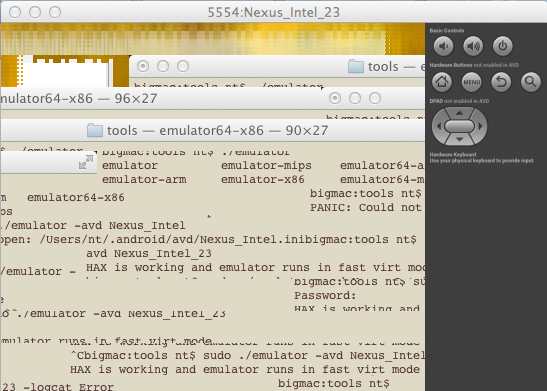 Browse other questions tagged android-emulator mac-os-x intel-haxm or ask your own question. How to do USB tethering with an Android Froyo and a Mac OS X? How to install and uninstall apk application from MAC to my mobile android? What is `Snapshot` and `Use host GPU` emulation option(s) for? does SDK disk images of APIs for windows and mac differ? EasyTether Pro and Mac OS X (El Capitan) 10.11.1 not connecting HELP!